Three of the authority's stations serve the East of England area: Mendlesham in Suffolk, Belmont in Lincolnshire, and Sandy Heath in Bedfordshire. The Mendlesham station, about fifteen miles north-west of Ipswich, was designed to serve the geographically large but not densely populated area of East Anglia. 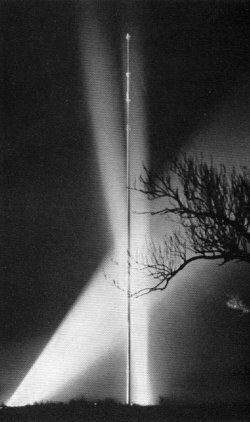 To avoid possible interference to European television services the power radiated over a south-easterly arc could not exceed about 15 kW. Other complications included the need to prevent interference in the service area of Chillerton Down, which uses the same channel. Thus, to secure adequate service to the coastal areas of Suffolk and Essex, the site for the station had to be displaced well to the south-east of the geographical centre of the required service area, and to compensate for this displacement it was necessary for the power radiated towards the west and north to approach 200 kW. Again, because of the very low height of the Mendlesham site, a 1,000 ft mast was considered technically appropriate. This was at that time the highest television mast to be constructed in Europe and the first of six of the same height subsequently used at other ITA stations. Building began early in 1959 and programme operation started on 27th October 1959. The Sandy Heath relay station, 10 miles east of Bedford, was designed to serve the Bedford area, where reception of Mendlesham was inadequate, and Peterborough, where reception of Mendlesham is often marred by interference. The 750 ft mast had a highly directional aerial radiating a maximum of 30 kW towards the north. The station, which was unmanned, broadcast programmes received by direct pick-up from the Mendlesham station. It went on the air on 13th July 1965. Belmont, the East Lincolnshire station, is situated about 7.5 miles south-west of Louth and 400 ft above sea level. It was agreed that the BBC should also use this site to improve both their VHF television and FM sound programmes in the area and that it should be scheduled as a main UHF station site. Accordingly a 1,265 ft mast was provided by the Authority to carry all the required aerials. The ITA's Channel 7 directional transmitting aerial is installed on the mast at a mean height of 1,000 ft above ground level and radiated a maximum of 20 kW e.r.p. The station, which was manned, rebroadcast the programmes transmitted by Mendlesham, received by way of an 'off-the-air' pick-up point at Massingham in Norfolk followed by a two-hop micro-wave link constructed by the Authority, the intermediate repeater station being at Winceby in Lincolnshire. The ITA's service at Belmont became operational on 20th December 1965.